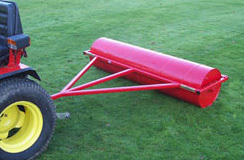 This heavy duty 106cm/42 inch steel roller is suitable for use with larger garden tractors. The 45cm/18 inch diameter roller is shaft mounted onto the frame with 25mm bearings. A scraper blade is fitted to the mounting frame to prevent a build up of soil or debris on the roller face. The SCH HGR roller can be water ballasted to add additional weight. For ease of filling, there are two filling/emptying points situated a each end of the roller.